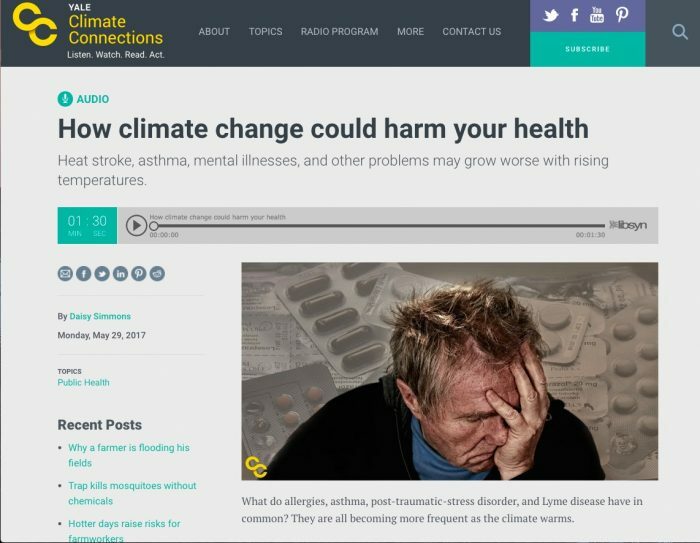 CICS-NC’s Ken Kunkel and Jesse Bell are quoted in a new series of stories on the connections between climate change and human health from Yale Climate Connections. Each story in the series is short (less than two minutes long) and available as both text and audio via the YCC website. A segment entitled “Cities prepare for global warming” explores how changes in extreme heat and heavy precipitation present particular risks to people living in urban areas, and how some cities are preparing to meet these challenges. Kunkel and Bell both served as authors on the official U.S. government report on the Impacts of Climate Change on Human Health that was released in early 2016 (read about our support for the report here).